Cyprus, an island located in the eastern Mediterranean, has two main airports. Most people fly into Larnaca Airport, but many do not stay and get to know this quaint, walkable town, which was founded by the Greeks in the 14th Century BC. Today, Larnaca has about 80,000 permanent residents who speak Greek as their first language. Never fear, however, as most of the population speak English very well. One of Larnaca’s best features includes a seaside promenade called “Finikoudes” (which means “little palm trees”). All through the year, during summer (in sunny, 30⁰C bliss) or winter (averaging 17⁰C), people gather in the cafés and restaurants along the Mediterranean Sea. The café- loungers talk not only with their mouths, but also with their hands. Greek Cypriots and tourists walk lazily along the beach, up to Larnaca Marina, down to the old fort built by the Turks in 1625. Back and forth, people stroll while chatting, inhaling the salty scent of the sea, and enjoying the feel of the sun on their shoulders. Sunbathers abound from May to October. Worshippers at St. Lazarus Church in Larnaca. Another favorite landmark of mine is the late-9th Century Church of St. Lazarus, a block up from the sea, near the old fort. It is said that Lazarus, after he was raised from the dead by Christ, went to Cyprus where he lived for another 30 years. Apparently, he was buried here, and the church is built over his tomb. Visitors can walk down into the tomb which is still located under the church. Tourists and worshipers mingle in a dance of photos and prayers. Worshipers cross themselves before each icon, then kiss it as praise and thanks to the saint depicted. 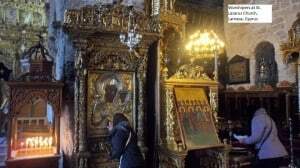 The must-see relic is a portion of St. Lazarus’ skull bone, featured in the center of the church alter. 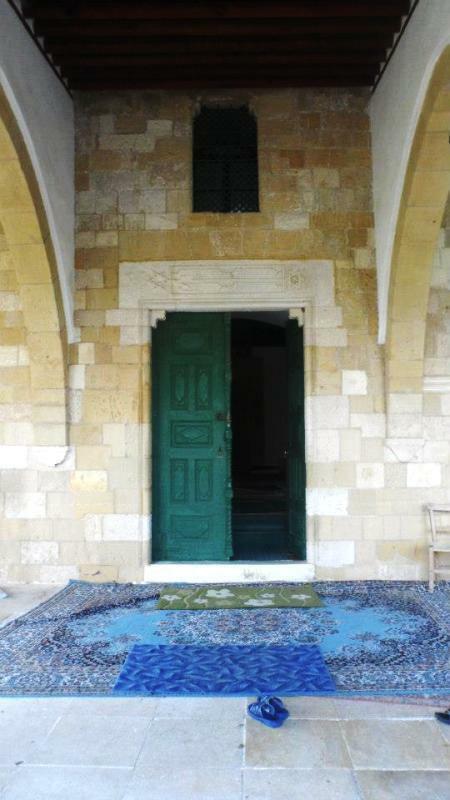 The entrance to Hala Sultan Tekke Mosque in Larnaca. 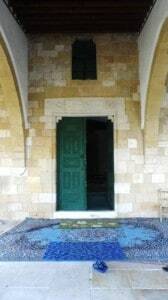 Hala Sultan Tekke Mosque, located near the airport, is the fourth most importantsite in the Muslim world. The story goes that Muhammad’s aunt fell off her donkey, died, and was buried here. Her burial site is inside the mosque, and can be visited by people of all faiths. This mosque sits just next to the Salt Lake, which is dry in the summer months, but brimming with birdlife during the winter. You can choose to walk around the Salt Lake on a nature path, or drive by to see the beautiful flocks of flamingoes enjoying the sunshine. Larnaca is great for families, but also has plenty of night life for the younger/single crowd. There are even places for the over- 40s to hang out. The Makenzie Beach area swarms with party-goers during the night (And by night, I do mean night). Clubs open at around 11 pm, but people don’t really show up until around 1 am. Since dinner doesn’t begin until 9 pm, followed by coffee (at Finikoudes, of course), that somehow works. 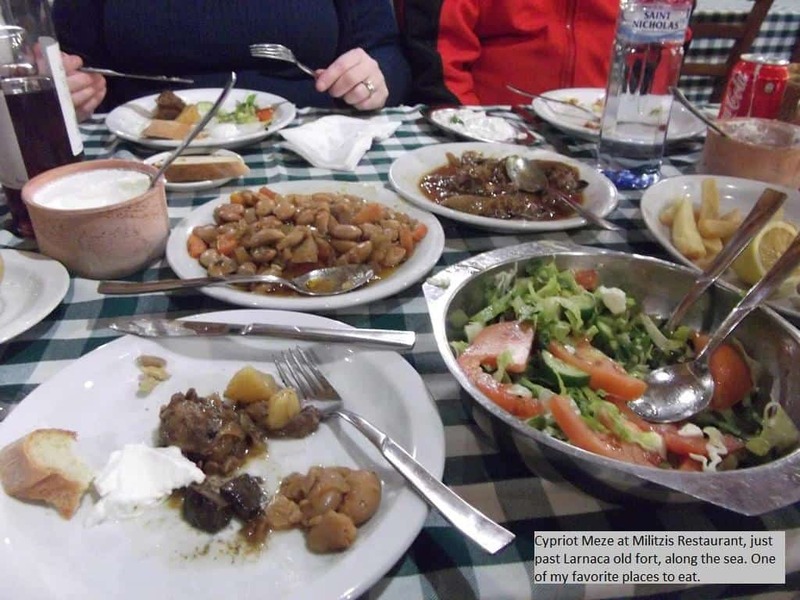 Cypriot foods merge salty and acidic flavors with meats like pork, chicken, and lamb. Roasted potatoes, salads drizzled with olive oil and red wine vinegar topped with feta cheese, and bulgur wheat side-dishes complemented by thick Greek yogurt add to the joy of dining out. Meze, “a little bit of everything”, typically includes grilled halloumi cheese, tzaziki, hummus, and always a lot of bread. Cypriot wines are tasty, abundant, and affordable. Now that I’m mentioning all this, I think I will plan for a summertime visit next year. Although getting around using public transit was a bit of a pill, I didn’t mind staying in Lefkoşa. The food was generally less salty, künefe was readily available, Famagusta was alright, and it was easy enough to hop into Nicosia for a few hours. Did you visit the northern section of the island too? Jonathan, I did actually visit the north- St. Hilarion Castle, and Kyrenia. I thought they were both beautiful, amazing places. I’ve booked another trip for June 2014, and can’t wait to go see Larnaca in the summertime again!